Notes & Queries - Help Needed !! Hurricane crash somewhere in Hildenborough? Club Cottages. First building on the left are Nos 1 -4, behind are Nos 5 -8. Difficult to see here, but those are chickens in the road! The cottages (numbers 5 – 8) began life as one house. English Heritage, when they visited to List the cottages in the late 1980’s estimated the main building as dating from the 16th Century, possibly earlier. The Victorians carried out a facelift when the timber frames, at ground level, rotted. They obviously jacked the building up, bricked the bottom half and then let the building down again. We know this because some of the timbers are out of alignment. Tiles were hung on the front side and rear elevations and the internal beams in the living areas covered over. The inglenook fireplace in No.5 was covered up and a Victorian grate substituted, only rediscovered in the 1970’s (Nicky and Barry Hart, our predecessors). As far as I can find out numbers 1 – 4 were built around 1820 at the same time as the refurbishment of numbers 5 – 8. On the 1842 Tithe Map the cottages were shown to be in the ownership of ‘The Benefit Society’, no doubt associated with the Poor Law. Occupiers are shown as “John Richardson and others”. The map shows that numbers 5 – 8 were divided into five cottages, not four, at the time. Also, a map dated 1867 clearly shows the cottages divided in to six!. The Tithe Map also shows the area around the cottages to be called the Hamlet of Hollanden and to be part of the Parish of Leigh. Over the back of the cottages, where ‘The Oast House’ is now, is shown as Hollanden Farm and to the north of the cottages, on the other side of the Hilden Brook, are Burnt House Orchard, Burnt House Meadow and Burnt House Field. There is no information on what happened there. Opposite the cottages is Home Orchard (now nos. 1-2 The Old Orchard and 1-2 Brownway Cottages) and on the other side of the stream to that the field is called Hop Field, now part of Princess Christian’s Farm, currently under the stewardship of Hadlow College, and used occasionally for sheep/cattle grazing. The decay of the cottages continued until 1939, when they were condemned. The outbreak of war saved them from demolition and they lumbered on after it. Mr Barkaway bought them all for £100 sometime in the 1950’s and then sold them on. We know a Mr Botting owned Nos. 2 and 7 when we moved in. Electricity arrived in 1951 and main drainage in 1968, when the cottages started to be sold off Freehold. · We bought No. 5 Club Cottages in March, 1978, and moved in the July (Nigel and Toni Simpkins). We bought the house from Barry and Nicky Hart but before them the owners had been Barry and Marilyn Starkey, the latter being Clerk to the Parish Council for many years. Toni and I had been living in Ilford, East London and coming to Hildenborough felt like coming to a holiday home. Over the years we had three children. Tragically our first died in 1983 and she is buried in the churchyard. Our second daughter, Louise, is a teacher up in Leeds and our son, James, a corporal in the Army Air Corps, currently seconded to the Army training regiment at Pirbright (2013). Aunt Annie, as she was known lived here in the 1950’s and was the first person to own a television. She became very popular with the local children who all crowded into her lounge to watch the new wonder (from Kath Reeves, No1 The Old Orchard). · When we moved in Jack and Polly Pearson were in No.8. Jack had been born in our cottage and had bought No.8 with a gift of money bestowed on him by an appreciative employer whose garden he had tended. He told me (in 1980) that Frank Rose (at that time in a nursing home in Sussex) had been a butler to Sir Winston and Lady Churchill at Chartwell from 1953-1958. His Mother had lived at No.5 and when visiting he and Jack used to go to the end of the garden to have a puff on one of Churchill’s cigars. I telephoned the National Trust at Chartwell who gave me the name of Churchill’s secretary at that time, Miss Hamblin. I telephoned her completely out of the blue and received a gracious reply that she remembered Frank but had no recollection of him living in Hildenborough. Jack had been a policeman in Tonbridge during the Second World War and recollected having to guard a crashed German bomber to prevent local lads from collecting souvenirs. He also mentioned that an anti-aircraft unit had been stationed up on the hill towards the village. Their daughter, Shirley, still lived with them at that time but eventually moved down to St. Leonard’s. · John and Betty Sands lived at No.7. They rented their cottage and were still using the outside toilet at the end of their back garden. Bet’s mother had lived in the cottage and Bet was born there and lived there with parents and six brothers and sisters. Betty was a gardener with a ‘green finger’ in the truest sense. She worked at Duncan’s Nursery in Coldharbour Lane and rode a creaky old bicycle. Every year daffodils still come up in the woods opposite, no doubt leftovers from the nursery which she planted. Their landlord, who had been pursued by his MP to modernise their cottage, died. His widow visited the cottages with her Agent and soon afterwards one of their bedrooms became an internal bathroom. Bet was a heavy smoker and tragically died of lung cancer. John outlived her by several years. He had been a grave digger in his working life but was also a keen gardener. Every year he would manually dig over his vegetable plot and dutifully tend it throughout the season. · Penny and David Wallis lived at No.6 and moved here in 1968. They still live here (2013). Their two children, Jake and Toby, went to the school at the top of the road. Penny retrained as a nurse after they grew up and ended up as a sister at the new Tunbridge Wells Hospital. · Brian Anderson aged 12 and Albert Anderson aged 6 both tragically died of diphtheria on the same day, December 28th 1944 at No. 4. Their Mother, Bertha (nee Nye) lived another 40 years and must have dreaded Christmas time. Both children are buried in the churchyard. When we moved in Arthur and Amy Seal occupied No.4. Arthur was Bet Sands’ cousin. Arthur had been in the Home Guard during the war (he is shown with his comrades in one of the pictures hanging in the village hall). I will always remember him for his ‘Mattock’. He was always offering to loan it out for any digging duties I undertook and I found it a most useful tool. One day he asked me to name a price and he sold it to me for £2. The best £2 worth I ever spent. In 2013 it is still going strong and only the other day dug up Toni’s unwanted berberis bush. · Grace Parker lived at No.3. She was a widow and had been deaf from birth but not dumb. It was hard to understand her as a lack of any kind of help with speaking had left her having to use mainly gestures. When the cottages flooded in the 1968 floods (from the nearby Hilden Brook) a policeman had apparently climbed a ladder to her bedroom window and shone his torch in to wake her up, so she could be evacuated. She had a light fixed up in her lounge which would come on if someone rang the front doorbell. · Mr and Mrs Jack Leach lived at No. 2. Still had the same landlord as John and Bet at No.7. They too had an outside loo which became redundant when they had one of their bedrooms converted to a bathroom. Mrs Leach was over the moon to get, for the first time in her life, hot water from a tap. She had used a kettle for nearly the whole of her life. One winter’s night Mr Leach fell over in the ice outside the back of his cottage and remained there all night as no one heard his calls. How he survived with hypothermia we will never know. 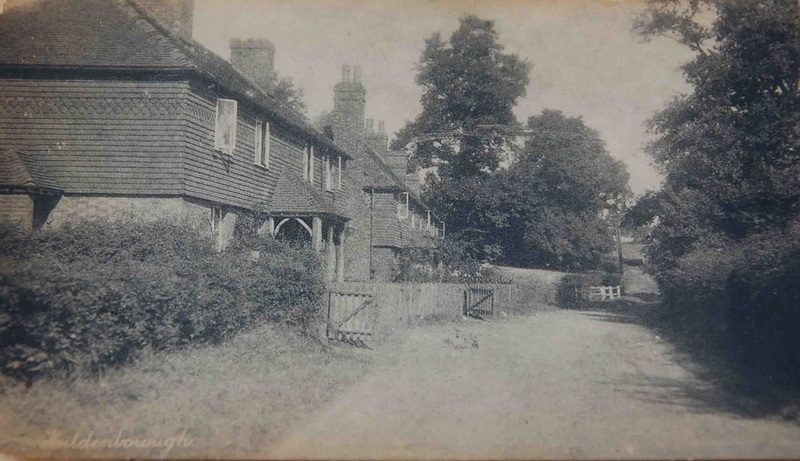 · We were told some years ago there was a well between the two rows of cottages under the concrete driveway. The metal stanchions holding the pump are still attached to our brickwork. In 2009 we broke up the concrete to lay a new brick driveway. The broken rim of the well was clearly discernible, but the well itself had been filled in.